The Thai House is situated in the heart of lush, peaceful gardens by the edge of a small canal (called a klong in Thai) in the Bangyai District, Nonthaburi – only a short 22 km journey to, and/or from, downtown Bangkok. The Thai House is not a hotel, but a delightful and distinctive home, that welcomes new and old friends from all over the world. Our story began in 1989, when Paiboone and Pip Fargrajang – both experienced tour operators and the parents of three daughters: Pu, Pla and Pang – decided to build their dream home: a traditional Thai style teakwood house. This would not be just a loving home for the family. Paiboone and Pip planned to share the beauty of this peaceful escape with travellers seeking authentic Thai hospitality and home-style Thai cuisine. 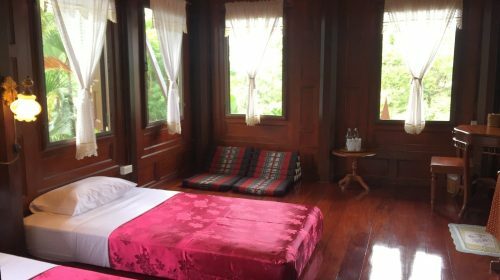 In 1990, the beautiful and traditional Thai style teakwood house was completed, and has been open as a unique home-stay ever since. There are only six rooms in the Thai House with the family living close by in the adjacent old family house on the klong. What makes us different is that we warmly welcome our guests as returning and future friends of the family, rather than as visitors. A year after it opened, The Thai House began to offer cooking classes in response to overwhelming requests from the many guests who had enjoyed the opportunity to sample Pip’s excellent and mouth-watering home-style Thai cooking. 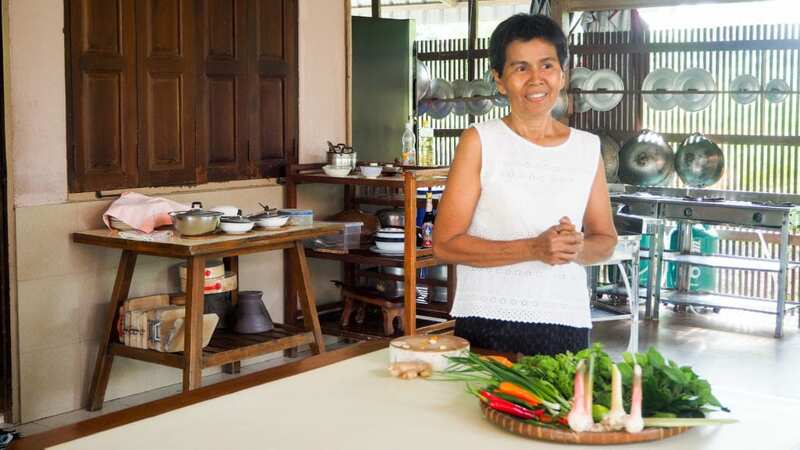 Since then, Pip has shared her passion and her love of cooking with Thai food lovers through fun-filled and always delicious Thai cooking courses. Over many years, the family has welcomed and shared our way of living with thousands of travellers from all over the world. The Thai House is your home from home. Cook your favorite Thai dishes in their original taste. Our home-style Thai cooking has love and passion as seasoning in every bite. Live like a local in genuinely Thai bedrooms that are simple, yet, special. 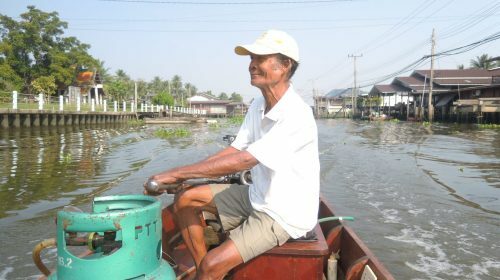 Take a boat trip with our neighbor, Uncle Wai and feel the charms of life along the canals. Thank you for welcoming us into your fabulous house. This is such an amazing experience. So peaceful after the noise and bustle of Bangkok. The cooking experience was excellent! Love the food and hands on learning. We’ll be making excellent Thai food from now on.Dear Pip+Pang – thank you so much for your warmth, passion & generosity in sharing so much about your life – we have learnt so much – and not just about cooking – which was wonderful! We wish you well – & thank you to Peerapong. Thank you for one of the best experiences of my life! Even though we come from different cultures, your warmth + hospitality made me feel right at home. The food was incredible + the boat ride made me want to cry with happiness. I am very grateful for this experience! Analiese O’Toole from Atlanta, USA. Thank you very much for opening your house and lives for us, we had a great time here. The cooking course was very good, I’m sure we learned a lot from it. Next time when we come to Thailand we’ll make sure to come back for more lessons. Take care, all the best regards of Jolanda and Bert Ottens. It was a great pleasure to attend again (after 11 years!) a cooking class at your wonderful Thai House. We learned a lot about Thai cooking and hope to take some ideas over to our “normal” kitchen. Rolf will try to held up the flag of The Thai House in Switzerland. Thank you so much and we hope to see you againnfor a 3rd cooking-round!